Are you one of those people who believe that bodybuilding is the only suitable physical activity for the tough alpha guys who want to build some serious mass and deadlift trucks, while yoga only serves the purpose of stretching the body and relaxing the mind? If the answer is yes, you’re in for a great surprise. Here’s the secret: bodybuilding and yoga are the perfect fitness formula for building a lean, powerful body, with the added bonus of developing an extraordinary mental fortitude. This unexpected combination can help you add a new quality to your physique and overall strength and set you apart from the average stiff bodybuilder. On top of that, it will make you feel great. Read the rest of this article to find out how you can enrich your bodybuilding routine with yoga poses. The general perception by bodybuilders seems to be that yoga is a means of achieving deep relaxation, rather than providing a “real” workout for muscular growth and strength. While people may bodybuild or practice yoga for a variety of mental and physical gains, the two disciplines actually complement one another quite well. If you ask the average bodybuilder, he’ll tell you that yoga doesn’t provide a real workout and doesn’t affect muscular growth and strength, which is a common misconception mostly based on the stereotypical less-than-favorable image bodybuilders have for those who practice yoga. 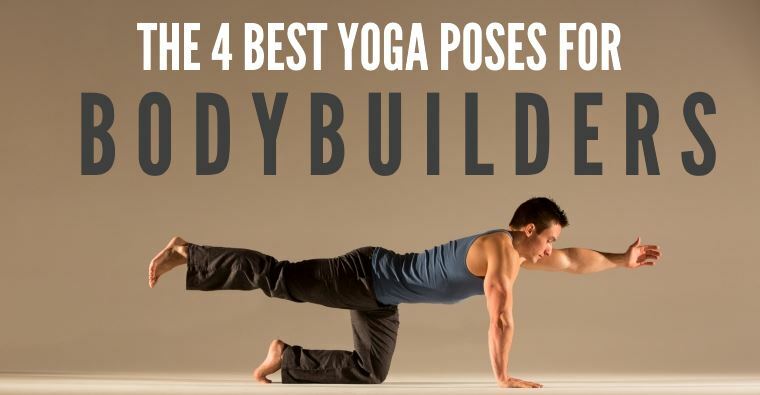 Believe it or not, as a holistic approach that targets the whole body, yoga can actually be a bodybuilder’s best friend. How? By doing wonders for your performance, endurance and perhaps most important of all, mobility. Bodybuilders are constantly placing a great deal of stress on their muscles and joints through repetitive movements and this practice tends to take its toll even in the case of experienced lifters with flawless form. Because of this, bodybuilders typically suffer from reduced flexibility in the shoulders, lower back and hips, which makes their bodies tight and stiff and more often than not, unable to bend enough to pick something up from the floor, not to mention that having tight muscles increases the risk of injury while performing dynamic movements even further. In addition, such rigidness contributes to a reduced range of motion, which can greatly diminish the effectiveness of any exercise, and it’s also linked to a number of potential injuries such as joint problems, muscle tears and back pain. Many lifters forget that their bodies need to be perfectly healthy and functional in order to perform at their best, and the lack of understanding for this fact usually leads to limited results and long-term injuries. If you constantly perform exercises with a short range of motion in a single plane of motion, your muscles will be shortened, your joints will be less than optimally mobile and functional, and eventually your performance will suffer. In this case, yoga poses are of vital importance because they will help you improve body composition and realign and correct any muscle imbalances or joint dysfunctions. Here is a deeper exploration of the benefits of yoga that can be especially useful for bodybuilders. One of the most fundamental elements in yoga is correct body posture, which is attained by aligning the body in anatomically correct positions and creating muscle balance. And so is in bodybuilding. Therefore, a crucial benefit from practicing yoga postures is that by helping you fix posture and form problems it can significantly improve your performance in the gym. In bodybuilding, isometric training is a highly efficient method for creating an optimal pump and encouraging greater muscle growth. Yoga poses are based on functional movements that include isometric contractions, essentially making up an endurance workout that can be highly effective in improving a lifters’ posing endurance, mind-muscle connection and ability to develop balanced strength, thereby leading to better gains. Practicing yoga will help you restore and increase your range of motion and muscle elasticity by opening up your body with its many forms of stretching (mostly passive, active, passive-active and PNF stretching) and improving the mobility of your joints. A healthy range of motion facilitates the development of muscle strength and enhances athletic performance. Stress is one of the biggest enemies of muscle gains because the hormonal changes associated with it harm the anabolic environment required for muscle growth. Many studies have shown that yoga can help reduce stress and anxiety and relax the body and the mind. One 2007 study even found that yoga has a direct positive effect on hormonal levels of GABA (brain gamma-aminobutyric), which means that it can be used to successfully combat anxiety disorders and depression. Since lower back pain is usually associated with having a sedentary lifestyle, it seems contradictory that athletes often suffer from back problems. The reason for this is that any weight-bearing sport or physical activity that involves repeating of rapid dynamic movements produces tension on the lower back, and without proper stretching, these overused muscles become very tight and increasingly prone to injury in the long run. Research has repeatedly shown that yoga can substantially improve lower back health and reduce any pain in the entire back area by improving spine health, releasing muscle tightness and improving muscle balance. Yoga can help you strengthen the smaller intrinsic muscles that are responsible for stabilizing the body and holding it in an optimal alignment but are usually weak in most people. Needless to say, weak muscles are at a higher risk of tearing when faced with a heavy load, so strengthening them will ultimately improve your balance, allow you to work with more weight and reduce your risk of injury. The rotator cuff muscles have the reputation of being one of the most vulnerable areas in the body that needs to be adequately strengthened in order to prevent injury that could stall bodybuilding progress. Any lifter who disregards this fact is at high risk of shoulder injuries which typically take a very long time to heal properly. Adding yoga poses to your routine can help you solve this issue and keep your shoulder strong and healthy, thereby boosting your performance in all major lifts. Breathing exercises are at the very core of yoga practice, and proper breathing is an important element of any muscle building routine – some would even go as far as to say that effective breathing is just as important to your training as the exercise itself. This is because proper oxygen delivery to the tissues enables optimal performance by battling fatigue and increasing the duration of the workout. By helping you correct your breathing pattern, yoga can beneficially influence the effectiveness of your training sessions.